March | 2009 | Voilà! artists studio. Miles Davis on tap. At the IAM conference, they had an art experiment – anyone could express their creativity through painting this bed. Can’t say I fully “got” this one…probably my issue. Chad with his angel wings…? My cousin Sarah, sporting the boots her hubby sold her the first day they met. Can you see the Statue of Liberty back there? On the Staten Island Ferry with Manhattan behind us. Continuing our story from New York, on day 2, Saturday, we had planned to take the Chelsea Art tour as one of our electives for the afternoon. However, we didn’t get the memo that said you needed to sign up for it as there was a limit of 24 people. That didn’t stop us though, and we decided to invite Jack to go with us and we had our own walking tour! I think it was more fun anyway as we could move at our own pace and not be influenced by anyone else’s views. Below are some images from a few of the galleries we ventured into. I have to say that our artists and galleries here in the KC Crossroads area are just as good if not better than the galleries we visited in this prestigious art district of Chelsea. It is interestingly similar how this area developed though, as it is very similar to how the Crossroads has evolved. Chelsea was once a lower rent district that attracted many artists as space was cheap….at least relatively cheap considering it was still New York City. However, once the art started taking off, more and more galleries were established and that drove up the rent forcing many of the artists out of the area. Many of them moved over to a community in Queens, which is just East of Manhattan island. Our friend Leigh Ann Dull lives in that area just a few blocks from one of the main studio buildings. See last picture with all the colorful graffiti on the outside. From what I understand, this is now happening in the KC Crossroads area as well. The area has become an attraction for many and with the surge of lofts and downtown living, this area has become financially restrictive for many artists and has forced them to move to other areas such as the West Bottoms district (which is where I have access to studio space for my photography) but also to other areas such as Hyde Park, and some pockets of Westport. Anyway, enough history for now, enjoy some of the images from our gallery walk through Chelsea, NY! This artist used black lights to create the glowing effect for his art. This was a really cool gallery and lots of fun to explore! This artist used photography in a unique way by cutting out parts of his image and placing them back on the image to give it a surreal and somewhat 3 dimensional effect. This is a detail shot of the clear finish this artist had placed on his photographic pieces. If you look closely, you can see where the artist cut the pieces out from the top layer for effect. This was an installation at one of the galleries. It included two of these houses accompanied by paintings of a little girl. These were her play houses. Here is the art studio that I mentioned above. This is the studio that many artists have moved to from Manhattan island. And it was worth it! As we share the benefits of this trip with you, we decided to share a lot of shorter posts, each with a different highlight. Partly because we think that will be more interesting for you and…well, partly because it seems managable:). 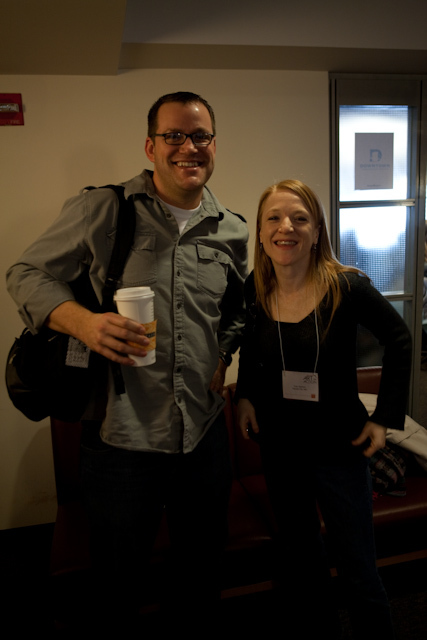 So, highlight number 1: Being late to our Friday morning session so we could meet Jack Fox in the lobby(see pic). Jack is a pastor at Maryland Community Church in Terre Haute, IN. He has been using art in ministry for around 5 years now with great success. It all started with a class he started on the 23rd Psalm (sound familiar?). They took a week to look at each image, and created an artistic representation of it. Through that class and other interactions with the church, 8 people decided to get baptized. Cool! Soon the group was creating artistic representations of the pastor’s sermon notes. They would be displayed in the foyer prior to the sermon, causing puzzled wonder as people entered, and interested understanding after they had heard the sermon. Eventually Jack sought grants and opened a small art space in downtown Terre Haute. He invites the community to come for free & work on their art. It’s opened a ton of new relationships for him. We look forward to learning more from Jack as we move forward.